It is a corporate Veteran’s fraternal organization of some 28,000 alumni of service with the 1st Cavalry Division, the FIRST TEAM, from the 1940’s through today’s active duty Soldier. It is non-sectarian, non-profit and non-political. The Association conducts annual reunions for its membership, publishes the bi-monthly SABER newspaper, and provides a focal point for member-to-member interface. It sponsors local Chapters when desired by a group of its members, and provides a contact point between former members of the 1st Cavalry Division, the active Division, and other Army and DOD establishments. Most importantly we offer annual scholarship grants to children of 1st Cavalry Division members killed in action, are 100% completely disabled, to children of 1st Cavalry Division Soldiers who die while assigned to the Division during training incidents, and to active duty Soldiers, their spouse, and children while assigned to the Division. The Museum Foundation provides support to the 1st Cavalry Division Museum and its programs with the ultimate goal of building a new museum to tell the story and history of the First Team. Both the Association and its two Foundations are supported by revenue from investments, donations, ongoing affinity programs, and occasional fund drives conducted to meet specific requirements. 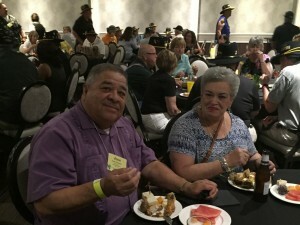 Associate membership is a non-voting membership category offered to friends of the 1st Cavalry Division and its Association who do not meet the eligibility requirements for regular membership, i.e., they have not been previously or currently assigned or attached to the 1st Cavalry Division. Associate membership may be either a Lifetime Membership or an Annual Membership. (fee of $150) provides you with a framed certificate of membership, membership card and lapel pin, and a five-year subscription to the SABER newspaper. (fee of $15 per year) provides you with a membership card, a membership certificate, a lapel pin and a one-year subscription to the SABE (all subsequent years, members receive a certificate and the SABER). Associate members have the privilege of attending all reunions and other outings held by the National Headquarters of the Association and share in the pride of affiliation with the Veterans of service with the FIRST TEAM.